The 12 Questions series of interviews continues this week with AJ Allmendinger of JTG Daugherty Racing. 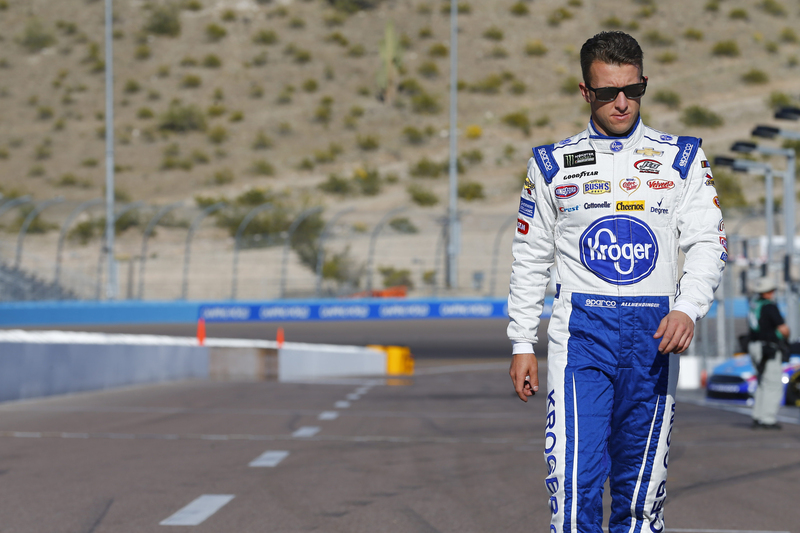 Allmendinger heads to Watkins Glen International this weekend as one of the contenders to score a playoff-clinching victory. Unfortunately, pretty much every day. Or nightmares. Either one. Depending on how it’s gone that weekend. It’s something I wish I could be better about –just shutting my brain off when I leave the racetrack and forgetting about the weekend, whether it was good or bad or not. But my brain’s never worked like that — and I’m 36, so it’s probably not going to stop until I’m done. No, no. It really doesn’t, because if you’re on the opposite end of it, you’re the guy getting hit or wrecked. The “sorry” really doesn’t matter. Whether you do think it’s on purpose or not, I think you say it just to try and make yourself feel better, especially if it’s on accident. If it’s on purpose, then you don’t really care. But yeah, you try to say sorry — but you know if you’re on the other end of it, it doesn’t matter to that person. That I care. Whether it’s about going out there and giving everything I have and knowing how much I care for my guys especially, knowing I appreciate them and care about how hard they work whether it’s going great or it’s going awful. I hope anybody who has worked with me knows that I leave the racetrack giving everything I have. I care about it. My passion for it, whether it comes out in a good way or a bad way, whether it’s frustration or happiness, I just care about it. I care about looking good for my guys, the sponsors, the team, for myself — and I will always care. I guess the day I stop just caring while I’m in the race car, I probably should just stop. But yeah, I think Tiger would be awesome to just take around the racetrack. I mean, it’s Tiger Woods, so there’s an aura around him. There’s very few people in the world that you can say, “Yeah, I’ve been around or been able to meet the best ever.” And Tiger would be one of them. Do you think after your racing career is over you can get good enough to be on the Senior Tour or something? No. I’m working on that. But I would love after my racing career to be able to do something on TV for golf. That would be probably something I’d be hugely passionate about and really get into. My golf game is definitely not close enough. I do have 13 years to work on it, but it’s not looking good right now. 5. In an effort to show this is a health-conscious sport, NASCAR decides to offer the No. 1 pit stall for an upcoming race to the first driver willing to go vegan for one month. Would you do it? Yeah. I’ve actually tried to go vegan in the offseason. I try to be as healthy as possible. What you put in your body is critical and I’m learning a lot more about it over the past year or two. I’ve kind of went through stomach issues — a lot of it is probably stress that I’ve put on myself — but food is definitely a big thing in that. It’s great having Kroger as a sponsor, because they’re very health-conscious and it’s fun to be able to talk to them about what’s in their stores. Especially their new stores, you can see the direction the world is going and they’re kind of following along with it, so I enjoy it. So I’m very fortunate to have Kroger as a sponsor to be able to do that. 6. It’s time for the Random Race Challenge. I’ve picked a random race from your career and you have to tell me where you finished. This is the 2014 Martinsville fall race, the Chase race that year. Do you happen to remember where you might have finished? The Martinsville fall race…I’m trying to think back, I’m just trying to get the exact number. I know how we ran there. I want to say ninth. Oh my gosh, yes! That’s correct. You finished right behind Denny Hamlin. You started 15th that day, that was the race that Dale Jr. won. You must be good at remembering races. I can remember most races, yes. That’s amazing. Why do you think that is? Because I care. That’s it. I couldn’t tell you my girlfriend’s birthday, I couldn’t tell you anything about dates or phone numbers or people’s names really, but I can pretty much remember every race that I was in. Do a lot of people get the answer right? (I remember) the races that I’ve run the whole race. (Although) in NASCAR it doesn’t matter if it’s 34th or 37th. But yeah, I can remember generically almost every race I was in and kind of how it went. (Laughs) I mean, right now, I’ll be honest, even though he doesn’t put out a lot of music anymore, I’d have to say Eminem. He’s got some sick lyrics still. But I mean, I would have to say 8 Mile is the best movie in the world, right? Nah, I’m just kidding. (Laughs) I’d have to go with Ryan Newman. It’s a big face. You’d have to run though. I didn’t say that I wasn’t going to get punished after. A close second — or a tie for first — is probably Brad (Keselowski). He’s been picked by a few people. I would say probably, if I had to go with recoil after the punch, I’d definitely take Brad over Ryan. I’m just assuming they might punch you back after. Yeah, and so if I’m going with that, if that was part of the question, if there’s a recoil…the only thing is I would have to run quickly if I punch Ryan. I think I can outrun him, but if he got to me, he’d land on me and crush me. I’m not sure how his eyesight is, but I’d go Tom Hanks for sure as my spotter. He’s got a soothing voice, just keep me calm. So I would do that. I guess it’ll be Taylor Swift as my crew chief because if the car’s going to be ill-handling, it’ll be nice to at least talk to her. And LeBron, in case I got in a fight after, you always want your motorhome driver to be a big dude. So if I did wreck somebody with my ill-handling car that Taylor Swift gave me, I’d need LeBron James to be there to throw down with me. Well, I really try to look at the urinals before qualifying and kind of where they’re located, and then I just try to qualify around that. It’s like Fontana, there’s only one, it seems like, down at the end of pit road — so you really have to qualify up front so it’s not that big of a walk. But you know, there’s certain tracks that have urinals right in the middle. So if I see that, then it’s like, “Yeah, 20th. Good for a bathroom.” It gives you extra time so you don’t have to get out of the truck, run to the bathroom and all of a sudden it’s the national anthem. That’s the excuse I’m going to go with for my mid-20s qualifying. Just all my medical bills, because I wouldn’t get halfway over. Really? You’re such an athletic guy though. Yeah, well, I’m a very athletically stiff guy, so the launch off the car would be (bad). I could get halfway over and land on my neck, so they probably have to cover my after racing life insurance policy, disability stuff, so I get paid. 12. Each week, I ask a driver to give me a question for the next interview. Last week’s was with Kaz Grala. His question was: Do you know anyone who can sponsor him, and if not, do you have a backup car he can borrow? No. And I’m always questionable with my practice habits, so I need my backup car. So I’m going to give him a big fat no and no. I mean, shouldn’t he go with possibly going to a zoo (for sponsorship)? He’s got an animal name, like a Kaz Grala. Seems to me like that’s what he could go with. Has he tried that yet? Maybe go back to him and ask him that. There’s a lot of zoos that would be up for sponsorship. The next interview I’m doing is with Ross Chastain. Do you have a question I might be able to ask him? Yes. Could he beat Joey Chestnut in a watermelon-eating competition? I love AJ “The Dinger” Allmendinger. His reaction to winning at Watkins Glen is up there in the top 5 of favorites. I also love the one where he kissed the camera and thanked Roger Penske for giving him a second chance at Road America in 2013. He’s also very funny on Race Hub ????. Derek Mason (Vandy football coach) said one thing he remembered from his Stanford days was David Shaw (head coach) saying “No” is a complete sentence. I would think ‘No comment’ is also a complete sentence, and is an acceptable answer to the punchable face question (“No comment” and “I need to see the video before answering that question” are two answers Nascar drivers need to use more often – saying nothing now and adding a comment later is a lot easier, and more sensible, than trying to retract a statement made while upset or angry.